​Khalil Mack is looking pretty good in his first game with the Chicago Bears, isn't he? Making life hell for the Green Bay Packers after not even a week in town, Mack came through with a pick-six off DeShone Kizer that extended their lead to 16-0 near the end of the first half to cap a truly dominant display. This isn't quite the matchup we were expecting for Sunday Night Football, though. Packers quarterback ​Aaron Rodgers was carted off the field early in the second quarter with an apparent knee injury. Kizer then became Mack's latest victim in rampant fashion. 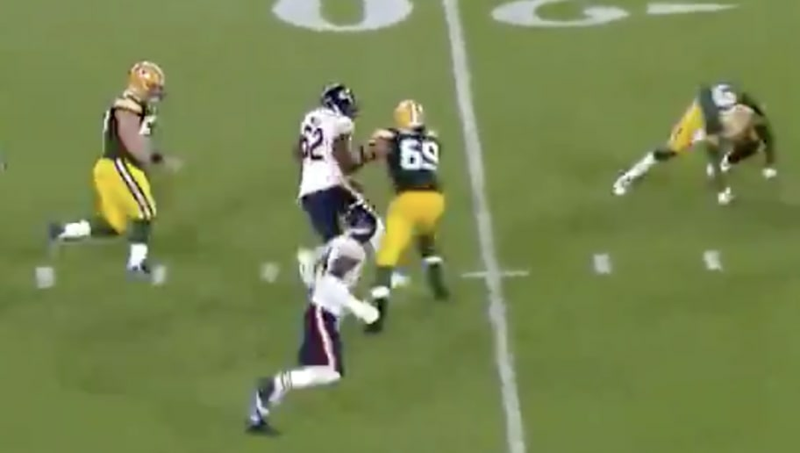 Not only did Mack get the score, but he also had a forced fumble earlier in the second quarter when the Packers were in the Bears' red zone. At the half, Mack had two tackles, a sack, an interception, a pass deflection, a forced fumble, and a TD. Did someone say Defensive Player of the Year? Mack was drafted by the ​Oakland Raiders fifth overall in 2014 out of the University of Buffalo, holding the NCAA record for most forced fumbles. Mack has been selected to three Pro Bowls and two First-Team All Pros while winning the Defensive Player of the Year award in 2016. Contractual differences forced Jon Gruden and company to trade him to the Bears, who instantly made him the highest paid defensive player in the game. It appears from his first game that the Bears have made a quality investment, haven't they?